You are here: Home / Mom Life / Tips, Tricks & Hacks / No Wifi? Netflix to the Rescue! No Wifi? Netflix to the Rescue! A bit over a year ago now, Netflix unleashed this new download feature where instead of streaming as you watch you can preload shows into your device. Last summer, they pointed out how handy it would be for road trips or for stays in cottage country. You can download a show before you hit the road and you’ve got a handy distraction for the kids. At one point they even had these neat road trip download stations set up in Ontario, so you could load up a movie between stops. So here’s the thing, and I realize some of you are going to think this is totally batty, but I don’t let my kids watch TV in the van. I think kids need to learn to deal with boredom. I think the ability to chill, stare out the window, count cows, and be alone with your thoughts, is a skill I want to impart to my girls. Well, that or family car karaoke, Eye Spy and long silly chats. I’m old school I guess. If I made it through all those long drives to Florida as a kid without a DVD player, then my kids can suffer through a 4 or 6 hour drive now and then. Which is why at first, the ability to download a show and watch it later didn’t appeal to me. But then my mother-in-law had to go for an overnight sleep apnea test and Netflix kind of saved the day. So I was a gold medal hero when I lent my mother-in-law my tablet with Planet Earth II preloaded. I pulled it off really last minute too. Like 20 minutes before she was heading out the door I hit the downloads section and grabbed the first episode. It’s pretty awesome that you can have your tablet loaded and ready to go adventure sans WiFi in under half an hour. Unfortunately, I didn’t think ahead and preload my iPad with something fun from Netflix, but I definitely ended up wishing I had — because I’m sure anything my mother-in-law picked would’ve beat out the Dr Phil marathon we were forced to endure. Overall I have decided that the whole Netflix downloads thing is my waiting room hero. 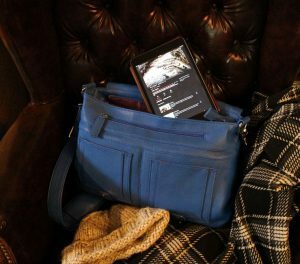 If you have to be stuck going to medical tests or specialist appointments, you can at least do it with some portable entertainment tucked in your purse. What about you folks? Have you tried Netflix dowloads yet? What do you do to pass the time when you’re stuck in a waiting room? This is why, in addition to whatever other projects I’m working on at the time (which I may pack along if I know I need them), I try to have a knitting project that lives in my purse. It *will* be there if I’m unexpectedly caught without anything to read or otherwise entertain myself with. But that doesn’t work for everyone. It requires a high tolerance for the occasional bent needle, tangles, and the risk of purse punctures if you don’t have point protectors.